Elevator mechanics install, maintain, or fix elevators, escalators, and moving walkways. Each type of work—installation, maintenance, and repair—requires a different skill set, and therefore those who work in this occupation usually specialize in one area. Elevator mechanics may also be called elevator installers, repairers, or constructors. Elevator mechanics earn a median annual salary of $79,480 (2017). 22,100 people work in this occupation (2016). Most jobs are full-time positions and include working overtime and being on-call in case of emergencies. 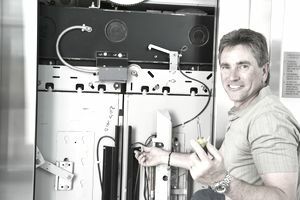 Building equipment contractors employ the majority of elevator mechanics. There will be a high demand for workers during this decade, mostly attributable to construction of non-residential buildings. The Bureau of Labor Statistics predicts employment will grow much faster than the average for all occupations between 2016 and 2026. The government agency classifies it as a "Bright Outlook" occupation because of its excellent job outlook. However, many people will apply for the available jobs making competition intense. "Examine, maintain, and repair elevators as well as other conveyance types"
"Determine the need for and perform major overhaul or replacement of defective equipment"
"Perform proper time keeping and accounting of materials and expenses for assigned projects"
"Follow appropriate maintenance and service procedures"
"Meet and assist with third party municipal inspections"
Elevator mechanics may have to be "on-call" to respond to emergencies and do repairs during the night and on weekends and holidays. They spend time working in tight places. This makes it a less than ideal choice for those people who are uncomfortable in those situations. This work can be dangerous. Injuries caused by falls, burns, and muscle pulls are common. To prepare to work in this occupation, you will have to complete a four-year apprenticeship that consists of 144 hours of technical instruction and 2,000 hours of paid on-the-job training. You will learn about electrical and electronic theory, mathematics, physics, safety, and how to read blueprints. Apprenticeships, which are usually sponsored by unions and contractors, are open to high school graduates or those who have earned equivalency diplomas. Applicants must be at least 18 years old and physically able to do the job. Before getting admitted to a program, you will have to pass math, reading, and mechanical aptitude tests. Taking math, shop, and mechanical drawing classes in high school will help prepare you. Elevator mechanics need a license to work in some states. To find out if your state requires one, see the Licensed Occupation Tool from CareerOneStop (Hint: typing only the word "elevator" into the search box will bring up all relevant job titles). Although it is not required, some people working in this field choose to become certified. Voluntary certification, available from trade associations like the National Association of Elevator Contractors, can make a job candidate more appealing to an employer since it demonstrates that he or she has met specific standards. Physical Strength and Stamina: As an elevator mechanic you must be able to lift heavy equipment and do grueling work for extended time periods. Detail Oriented: This ability will allow you to keep track of maintenance schedules. Troubleshooting: You will have to determine the causes of problems. Critical Thinking: Before you can fix some problems, you will have to identify and compare alternative solutions. "Demonstrated customer service skills and the ability to remain calm when confronted with difficult situations"
"Applicant must be able to lift and move eighty pounds without assistance"
"Must be a strong team player and must be able to work independently and as a team member"
"Takes direction in a positive manner"
"Must have demonstrated strong mechanical reasoning and comprehension skills plus hands-on mechanical aptitude"
"Able to follow instructions, make suggestions, and is willing to learn"
Electrician Installs wiring and other electrical components in residences and businesses. Sources: Bureau of Labor Statistics, U.S. Department of Labor, Occupational Outlook Handbook; Employment and Training Administration, U.S. Department of Labor, O*NET Online (visited May 24, 2018).